trust in you, O God. the LORD in the land of the living. The Holy Covenant of God with Israel is renewed with Moses, who is described as “a very humble man, more so than any other man on earth” (Nm 12:3). God chooses and invites Moses, his brother Aaron and two sons (Nadab and Abihu), and seventy other elders of Israel to come up to the Mountain of God and worship at a distance (Ex 19:22), however only Moses is commanded to ascend to the summit of the Mountain, which was surrounded by clouds and fire. Although God cannot be seen directly, the divine presence of the Almighty One speaks to Moses face to face, and he conveys the Word of God to the people. A Covenant is made between two contracting parties in agreement, which in this case is between God and the children of Israel. God has revealed to the people what is imposed upon them through Moses’ recitation of the Law (Ex 20-23), and the people unanimously agree in unity and declare their willingness to perform the prescribed duties given to them. Moses, acting as the mediator, writes down what God has spoken to Him in the silence and secrecy of the summit and makes an official record called the ‘Book of the Covenant’ that is to be obeyed by the chosen holy nation. Later, the Book of the Law will be placed beside the Ark of the Covenant when the Tabernacle is built. God’s spoken word is written by the hand of man and preserved by their authority, however in order for the Jewish covenant to be ratified and binding a sacrifice must be offered, blood must be shed to seal the Covenant, and sprinkled upon the people in a solemn and affecting ceremony. The next day at the foot of the mountain Horeb (Mt Sinai) an altar is built. It signifies the earthly footstool before God’s real presence at the Mountain, and is placed off-limits to the rest of the people. Erected around the altar are twelve boundary-stones or pillars that represent the twelve tribes of Israel. These do not serve as mere memorials but represent the presence of Israel gathered together before the Throne of God. Under the direction of Moses, young men (acting as priests) are chosen to represent the tribes, and sent out for the purpose of killing and flaying, the young oxen, presenting them to the Altar for the whole burnt offering that will be the first holy rite of the Covenant. A second rite will later conclude the ceremony by a communion of the sacred meal that was sacrificed. In the first procession of rites several young bulls were gathered and slaughtered, pouring out a considerable quantity of blood that would fill several basins. The blood of the atonement was spilled and then divided into two parts: one half to be poured on the sides of the altar and sprinkled by hyssop and the other half was dedicated for the surrounding pillars. Although the blood was divided into two parts, it was not a mixture of different kinds of bloods but of one blood and signifying one union between the altar of God and the footstool of man. The sacrifice of animal life served as an expiation of pure life for sinful man, and thereby restored the fellowship of God with man that was destroyed by sins committed against the Lord. The sacrificial blood was first sprinkled upon the altar before the living God to manifest that the people have given up their lives to God and have passed through death. Then the sacrificial blood was sprinkled upon the people (that is, thrown in the direction of the people with hyssop branches) to signify a restoration of life that was renewed by the grace of God’s mercy. Through the divine grace that was manifested upon the altar, the human soul received the forgiveness of sins that would sanctify and lead men into a new and holy life. The Blood of the Covenant showed a bond of union of God with man and the unity of Israel. It was a renewal of life and an entering of Israel into the Kingdom of God, which composed of the priests and the children of Israel belonging to the twelve tribes, both of who were now filled with divine grace and raised into the unity of God’s beloved nation and mother. After the sacrifice of the whole burnt offerings and the sprinkling of the blood in the ratification ceremony, Moses, Aaron and his two sons, and the seventy elders walked mid-way up the mountain of God to share in the communion and consumption of the sacrificed flesh, the peace offering, before the presence of God (Ex 24:9-11). Together those who gathered before the Lord were able to eat of the one flesh and drink of the one blood of the Old Covenant. This sacred meal was an offering of peace and thanksgiving, the final seal placed upon the Covenant. This communal feast before the presence of the Lord by the chosen priests was the climax of the Mosaic Theophany that renewed the intimate relationship of the chosen people with the Almighty God of Israel. God has led the people out of the slavery of Egypt, defended Israel from Pharaoh, saved them by the waters of the Red Sea, driven them out to the desert for purification, provided manna and meat through grace from Heaven, fed their souls with faith and trust, and gathered the chosen nation before God’s holy Mountain. It was God’s will to separate the Jews from the world, so they could place their faith and trust in the Lord, and set up a hierarchy and law that would guide the people towards the Kingdom of God. This divine government would obey God’s will and share in a bond of unity, God’s gift of mercy, peace and unity. God engraved the Commandments upon the Rock and the Mosaic Laws spoken through the mediator and prophet Moses, a foreshadowing of the Church to come and Christ. A hierarchy was established of prophet, priest, people, and later king, upon which all were to consent and submit to the holy laws faithfully. Mercy was shown upon the people through the sacrifice, suffering, and pain of the sacrificed oxen. Consequently salvation was promised to the chosen nation by their obedience of the Law, and Victory was promised to come by the Messiah and King of Israel, who would lead the chosen nation into the glory of God. Israel therefore sought a king who would defeat the enemies, build God’s glory upon the earth, and rule with the mighty hand of authority. The appetites and pride of men eventually however outgrew their laws and sacrifices which pushed their traditions and ways away from God and towards self-glorification in the name of God. “Behold, days are coming,’ declares the LORD, ‘when I will make a new covenant with the house of Israel and with the house of Judah, not like the covenant which I made with their fathers in the day I took them by the hand to bring them out of the land of Egypt, My covenant which they broke, although I was a husband to them,’ declares the LORD. But this is the covenant which I will make with the house of Israel after those days,’ declares the LORD, ‘I will put My law within them and on their heart I will write it; and I will be their God, and they shall be My people. They will not teach again, each man his neighbor and each man his brother, saying, ‘Know the LORD,’ for they will all know Me, from the least of them to the greatest of them,’ declares the LORD, ‘for I will forgive their iniquity, and their sin I will remember no more” Jer 31:31-34. God is faithful. The Almighty Father has fulfilled His promise and instituted a New Covenant, a New Testament, a New Law and Government upon the High Priest, Jesus Christ. The Lord is the King of kings, Omniscient Prophet, Lamb of God, Fountain of Mercy, Judge of Nations, Head of the Church, and Eternal Savior, who came down from Heaven and was born into the world of sins in order to redeem it through His mediation between God and men, His sacrifice upon the Cross, and the glorious Resurrection. 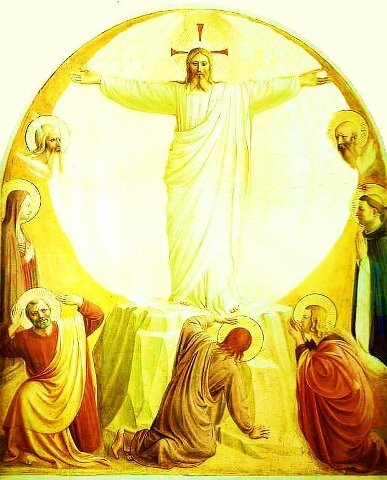 As the Lord descended in Spirit from Heaven’s Mountain, so He ascended to the right Hand of the Father in Body and Spirit, and sent the Spirit of God upon His Body of the Church. The Church has been sent out to teach all nations in spirit and in truth, baptize the people into one faith, to dispense His grace and mercy, and be His authority until He comes again. Christ was sought after by Herod, fled with His family into Egypt, was led into the desert for purification, passed through the river of Baptism, received the Spirit of the Lord from Heaven’s Mountain, chose His priests and prophets, was transfigured before a select few upon the Mountain in the presence of Moses and Elijah, instituted His Covenant at the Last Supper, poured out His Blood for the redemption of sinners as the Covenant seal, and has given His flesh to be eaten at the Altar in His Presence. The Lord has come to revive what has been dead, to build what has been broken, and to waken what has been asleep. 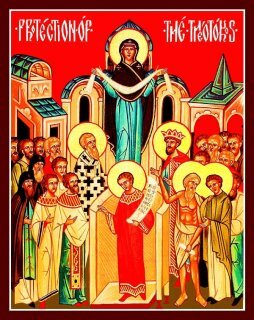 The Little Daughter of Zion has risen because she has been touched by the Lord, has received and eaten true Bread from Heaven by the Mercy of the Lord, and today walks among men in the Spirit of God. The fear and law of the Old Covenant has been fulfilled by the faith and love in the New Covenant, and men are no longer called slaves but friends of the Lord who has come into the flesh and revealed the Eternal Word of God in Man. “Six days later Jesus took with Him Peter and James and John his brother, and led them up on a high mountain by themselves. And He was transfigured before them; and His face shone like the sun, and His garments became as white as light. And behold, Moses and Elijah appeared to them, talking with Him. Peter said to Jesus, ‘Lord, it is good for us to be here; if You wish, I will make three tabernacles here, one for You, and one for Moses, and one for Elijah.’ While he was still speaking, a bright cloud overshadowed them, and behold, a voice out of the cloud said, ‘This is My beloved Son, with whom I am well-pleased; listen to Him!’ When the disciples heard this, they fell face down to the ground and were terrified. And Jesus came to them and touched them and said, ‘Get up, and do not be afraid.’ And lifting up their eyes, they saw no one except Jesus Himself alone. As they were coming down from the mountain, Jesus commanded them, saying, ‘Tell the vision to no one until the Son of Man has risen from the dead” Mt 17:1-9. “While He was still speaking, they came from the house of the synagogue official, saying, ‘Your daughter has died; why trouble the Teacher anymore?’ But Jesus, overhearing what was being spoken, said to the synagogue official, ‘Do not be afraid any longer, only believe.’ And He allowed no one to accompany Him, except Peter and James and John the brother of James. They came to the house of the synagogue official; and He saw a commotion, and people loudly weeping and wailing. And entering in, He said to them, ‘Why make a commotion and weep? The child has not died, but is asleep.’ They began laughing at Him. But putting them all out, He took along the child’s father and mother and His own companions, and entered the room where the child was. Taking the child by the hand, He said to her, ‘Talitha kum!’ (which translated means, ‘Little girl, I say to you, get up!’). Immediately the girl got up and began to walk, for she was twelve years old. And immediately they were completely astounded. And He gave them strict orders that no one should know about this, and He said that something should be given her to eat” Mk 5:35-43. “While they were eating, He took some bread, and after a blessing He broke it, and gave it to them, and said, ‘Take it; this is My body.’ And when He had taken a cup and given thanks, He gave it to them, and they all drank from it. And He said to them, ‘This is My blood of the covenant, which is poured out for many. Truly I say to you, I will never again drink of the fruit of the vine until that day when I drink it new in the kingdom of God.’ After singing a hymn, they went out to the Mount of Olives” Mk 14:22-26. “And Jesus took with Him Peter and the two sons of Zebedee, and began to be grieved and distressed. Then He said to them, ‘My soul is deeply grieved, to the point of death; remain here and keep watch with Me.’ And He went a little beyond them, and fell on His face and prayed, saying, ‘My Father, if it is possible, let this cup pass from Me; yet not as I will, but as You will” Mt 26:37-39. As Jesus hung on the Cross: …”Jesus knew that everything had now been completed and so that the scripture should be completely fulfilled, he said: I am thirsty’. A jar full of sour wine stood there; so putting a sponge soaked in the wine on a hyssop stick, they held it up to his mouth. After Jesus had taken the wine he said, It is fulfilled’; and bowing his head he gave up his spirit” Jn 19:28-30. What good is the blood of goats and bulls? But if these have sanctified those who have been defiled and made their flesh clean once again through God’s grace, command and men’s faith and obedience, then how much greater, more powerful and merciful is the Blood of the Lamb of God? 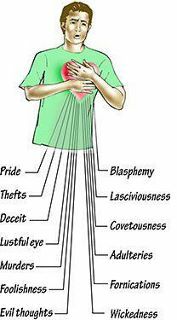 How much more will the Blood of Christ bring man to their knees in repentance in obedience, how much more will His Offering cleanse the conscience from dead and sinful works, and draw all men to worship the Living God who has poured out His Mercy into empty vessels. “Then Jesus poured water into the basin, and began to wash the disciples’ feet and to wipe them with the towel with which He was girded. So He came to Simon Peter. He said to Him, ‘Lord, do You wash my feet?’ Jesus answered and said to him, ‘What I do you do not realize now, but you will understand hereafter.’ Peter said to Him, ‘Never shall You wash my feet!’ Jesus answered him, ‘If I do not wash you, you have no part with Me.’ Simon Peter said to Him, ‘Lord, then wash not only my feet, but also my hands and my head” Jn 13:5-9. How little and insignificant is man before the Almighty Lord, how lowly can a man feel when the infinite God has stooped down from Heaven’s Throne and has revealed Himself and His ways of humility and love for His creation and the world. 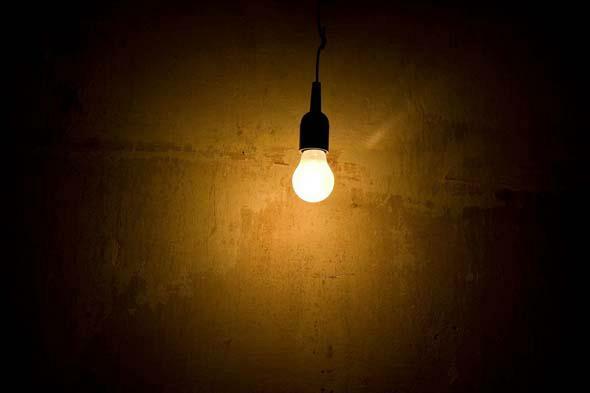 Christ is the Light of the world and has shined upon the darkness. The Son of God has sacrificed all and became the Victim for our sins so that we may be born again with peace, mercy, and love for all people, and be voluntarily led towards God by the way of His sacrificial love. Christ is the Bread from Heaven who has offered Himself to be eaten so that men may be filled with true and eternal nourishment through the power of the Holy Spirit. Life upon the earth has been renewed by the coming of the Lord, who has formed a new way of life in the spirit and truth of His Body, the Church. This faith and truth we receive through our Mother Church as we partake in the Supper of the Lamb. We stand as beloved disciples at the Cross of sacrifice and mercy in praise, adoration, and thanksgiving. As we enter into the Penitential Rite of the Mass we confess our venial sins and are forgiven by the blood sacrifice of Jesus Christ, the Lamb of God. Those who have separated themselves from God through mortal sins must be sprinkled with the hyssop of Heaven in the Sacrament of Reconciliation prior to Mass. The imprisonment and slavery that sin has shackled upon the soul must be touched and loosed by the thirst of the Lord upon the Cross for the sinner who has loved the repentant to the end. No man can enter into the Holy of Holies unless they have been restored into the divine life with sanctifying grace and made perfectly clean. After the purification rites are fulfilled we are able to pass through the moat and fortified walls by Christ’s grace, and consequently journey from the darkness and death of the world into the Holy City of God. The Liturgy of the Word begins once the Introduction Rites are completed by the faithful conformed into the unity of the Church. The Word of God is spoken and fills the hearts of men, lifts their spirit to the inner chambers of the Lord and draws them to the heights of Heaven. In the Liturgy of the Eucharist we are invited to enter into the mystery of the Lord’s Holy Sacrifice and Resurrection. Here the chosen and elect climb onto the Mountain of God and receive Christ in the Sacred Bread. Those who live apart from the Church are warned to not step upon the Mountain of God without being consecrated, in order not to pass judgment and condemn themselves (Ex 19:12). Through the Liturgy of the Eucharist at Mass we enter into the Holy of Holies and Throne of God at the Footstool of the Church. St. Paul warned the faithful that before receiving the Eucharist, consecrated by the Priest, everyone must examine themselves to be baptized into the faith of the Church, and be cleaned of all sin in order to partake of the Body and Blood of the Lord. Whoever eats and drinks the Body and Blood of the Lord without recognizing the Lord and the Baptism of the Church, eats and drinks their own condemnation (1Cor 11:27-32). The Most Holy Eucharist is the source and summit of grace within the Church because God is present Body, Blood, Soul and Divinity. The very summit of the Mountain is reserved for priests who live in the presence of the Lord and speak to Him face to face as sons at the right hand of the Father. As Moses humbled himself before the Lord and was led by God to receive the Old Law and Covenant, so do Priests humble themselves before the presence of the Lord and receive the New Law and Covenant to share with the children of God. When we receive the real presence of Christ we unanimously accept the faith of the Church, the laws and traditions of Jesus Christ, the mercy of the Lord by His sanctifying Blood, and partake in the consumption of the flesh of the Son of Man who carries us into eternal life in His Spirit. Through faith and the power of the Holy Spirit we are united to Christ in a real and unbloodied manner. Apostolic Succession continues the direct lineage that today’s priests have with Christ by the ‘Laying of Hands’ at ordination. It is the Lord who has fulfilled the mission He received from the Almighty Father, and the Lord who has the authority to dispense the authority upon men. The Church continues the Father’s mission by walking in the faith, mercy, and love of the Son, guarding the truth and leading the Body of Christ towards Salvation. This divine power is given to the Servants of Christ by the command and will of God who is made manifest through grace within the Sacraments of the Church. By the power of the Holy Spirit divine life is poured down upon the faithful from Heaven. Throughout the centuries the bishops of the Church have continuously passed God’s gift of grace and power to bring down the Bread of Heaven to the earth. God hears the prayers of every individual, however the priest has received the power to open the doors of Heaven and bring the living God upon the Altar of the Church. It is the duty of the zealous faithful to waken in the Spirit of God they have received, preach the Gospel, become witnesses to Christ, and open the doors of true enlightenment to those who live apart from Christ’s Bride and the Wedding Feast. Christ invited the disciples, and they followed. Christ spoke His commands and they obeyed. Christ gave His teaching and they heard. Christ breathed upon them His Spirit and they were sent off to preach the word and make disciples of nations, to gather all people into the One Body of Christ and One Faith. The Kingdom of God already begins upon the earth, and it begins in faith and humility. Faith that leads to hope and love, and Humility that leads to obedience and following the Lord. An individual cannot be the Lord’s disciple without one or the other. Grace pushes every man forward to make the climb to the Mountain of the Lord in order to receive the Holy Spirit. God has invited every man, but only the poor man seeks the real presence of God, who understands his lowliness in the world. Christ has become poor to bring the glory of God and Spirit to man. Blessed are those who seek for the real presence of the Lord, who has purposely made Himself small and hidden so that beloved children of God, may not be afraid, but believe, receive and be nourished by the true Bread from Heaven. “Jesus then said to them, ‘Truly, truly, I say to you, it is not Moses who has given you the bread out of heaven, but it is My Father who gives you the true bread out of heaven. For the bread of God is that which comes down out of heaven, and gives life to the world.’ Then they said to Him, ‘Lord, always give us this bread.’ Jesus said to them, ‘I am the Bread of Life; he who comes to Me will not hunger, and he who believes in Me will never thirst” Jn 6:32-35. 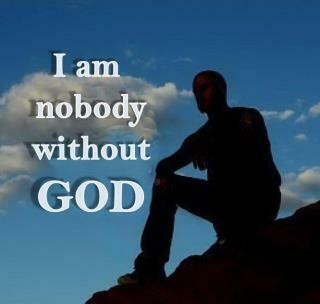 Without God,I Am Nobody. Without God,I Am Nothing. are filled with the knowledge and love of Thy Son.